Prolight + Sound is always a place for international premieres and innovations. 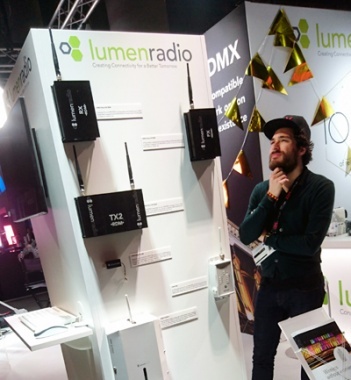 The Swedish producer LumenRadio didn’t just bring their wireless DMX and light control solutions along to Frankfurt, it also celebrated its ten year anniversary. “To celebrate the 10 years means much to the company,” according to Lilli Lundqvist, Marketing Manager at LumenRadio. In 2008 LumenRadio was founded from the current CTO Niclas Norlén. He had this idea that you must be able to control light in a much smarter way. So with unique technology and patents the company quickly became a leader in wireless lighting control and is today the de facto standard for film lighting, architectural lighting and professional lighting. Together with clients, the internationally leading provider of wireless lighting controls, DMX solutions and connectivity enablers celebrated this development at the Prolight + Sound 2018 – and two new products: the wireless light-control tool MoonLite and the completely integrated, wireless DMX / RDM module TimoTwo. The new MoonLite brings together prize-winning CRMX technology with Bluetooth connectivity, integrated battery, and the possibility of using it with the new CRMX toolbox app. This makes the MoonLite a unique tool in the lighting technician’s toolbox. In contrast, TimoTwo is a completely integrated wireless DMX / RDM module offering Bluetooth connectivity and a reduced RF footprint. Based on the TimoOne Tool introduced in 2014, the successor expands the previous functions with Over-the-Air company updates and in this way, becomes a reliable and useful radio module for wireless DMX. The two products use the new DMXmesh function that has been registered for a patent. This technology makes each receiver and every device also work as a repeater. This means all devices are coordinated and ensures that the wireless cover can be optimally expanded. The DMXmesh function also offers a significant time savings for the installation and wireless use for architecture and architainment illumination. The MoonLite and TimoTwo were presented at Prolight and Sound 2018 and will be released in the 4th quarter of the year.